I was listening to the radio recently, and the host kept going on and on about how horrible it would be if the NDP actually formed the opposition, and how much WORSE it would be if they formed government. So I started asking what’s so terrifying, what’s so frightening, about the NDP. Turns out, one of the things that’s terrifying is that the NDP may be (now, don’t panic here) a little bit socialist. DON’T PANIC. We’re just TALKING about it. We don’t actually *have* an NDP government yet, so you don’t need to run screaming into the streets because someone is going to show up at your door, steal your wallet, and give it to someone in the ‘hood. Yet. Here is an artist’s representation of eyewitness accounts of the terrifying New Democratic Party. The sketch artist who produced this image is The Nipper. I think you’ll see a great depth of understanding of the sheer terror of socialism. 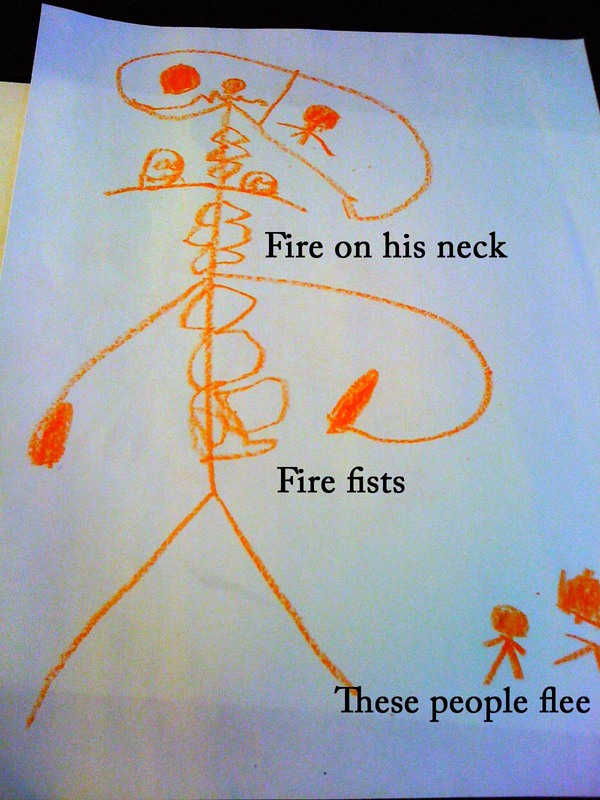 You can see from this image that the horrible Orange Monster, the bastardly Socialist, accomplishes his/her Nefarious Goals by utilizing its primary weapons, those being the fire on its neck, and its huge fists made of fire. It will SMASH! through the opposition. This is undemocratic. The Canadian people inherently understand this, and flee from the Socialist Orange Menace. Note the monster has an enormous prefrontal cortex and very little cerebellum. Researchers aren’t too sure yet what this means, but they’re pretty sure it can’t be good. That fire neck is chilling. 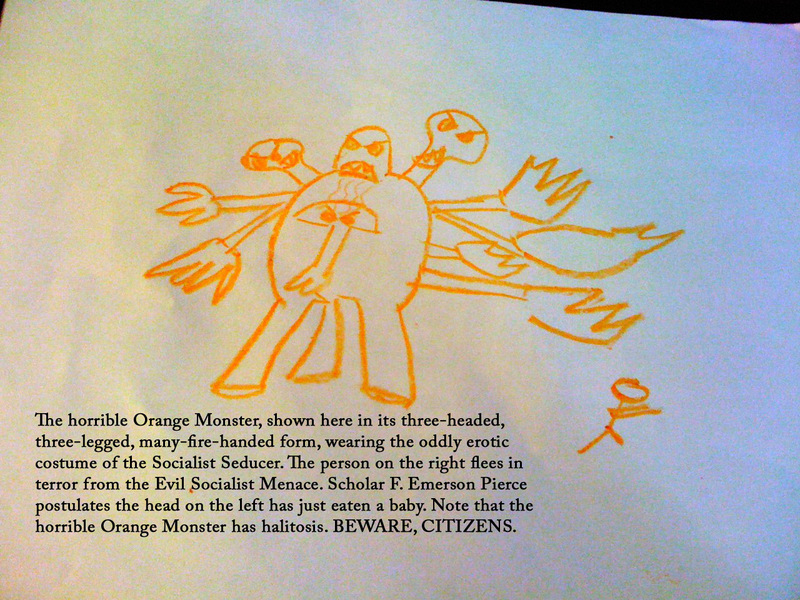 As we can see in this artist’s representation of the Orange Menace, it is extremely aggressive, and has what appears to be a really rotten attitude. With elephantine lower extremities, it will stomp out all vestiges of democracy, capitalism, and free enterprise. With its many arms ringed in fire, it will singe the very corners of our flag. It will light the fires of rebellion and revolution and Canada will end up, as we all know, as a smoking hole of ruin. DEAR GOD, WON’T SOMEONE THINK OF THE CHILDREN? This aspect of the Orange Menace has many heads. This is representative of multiple theologies (NOT, as some argue, of the Holy Trinity – no indeed! Beware, for the Orange Menace proposes to separate church and state! ), and of the three horrible aspects of socialism: equality, co-operation, and needs-focussed economic structures. Two of the three heads are capable of full 180 degree turns (those representing co-operation and needs-focussed economic structures), while the third (equality) always looks forward. It is clear that Canadians flee in terror of each of these three aspects. Here, the Orange Menace relentlessly pursues the other political leaders. In this image, the Orange Menace is represented as a dragon/rodent/bat/rabbit-like…er…something or other…with delicate ankles and a horrific rictus. You may note the tongue is forked. The tail, which is at once rat-like and scorpioid, contains a sting which will inject its victims with the overwhelming desire to help one’s neighbour raise a barn. The Orange Menace rampages ploddingly while Elizabeth May weeps, Stephen Harper learns to dance, and Michael Ignatieff passes right out on top of Gilles Duceppe (not shown). This image is an accurate representation of Canada’s 41st election race. 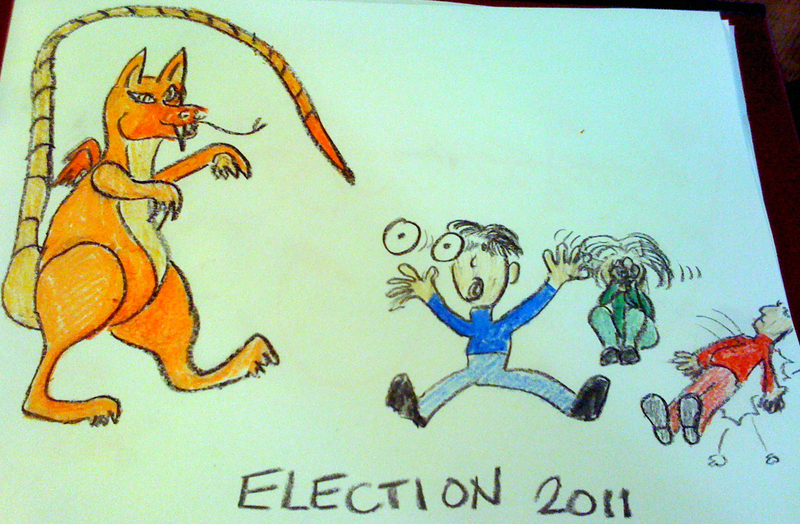 Buoyed by increasing relevance with young voters, and inspired by rising popularity, the Orange Menace relentlessly pursues its one unending goal: to spread an evil gut-based parasite that fuses to the host’s nervous system and causes the host to only check off “NDP” candidates’ names on ballots. Elections Canada is unsure as to the legality of the use of parasites in federal elections, although most Canadians will tell you there have been parasites working in politics since the beginning of time. So you see, there is reason to fear the Orange Menace. It could undermine everything we hold dear as Canadians. Um. Those things being poutine, hockey, and saying incredibly stupid things on the radio. *incidentally, if you would like to use any of the artists’ representations of the Orange Menace, you may ask permission from cenobyte by emailing c3n0byte at gmail dot com. Alternately, you could leave a comment and let cenobyte know which version (N – Nipper; C – Captain; R – Rampage) you would like to use. One of your best blog posts. Really frickin’ funny. Shared.